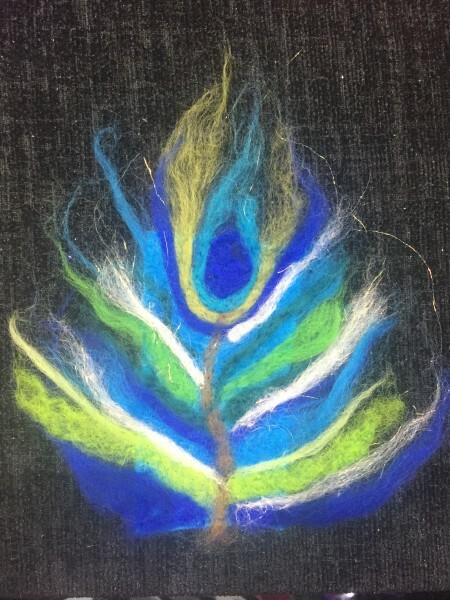 I specialise in Applique Needle Felting where the Merino wools and embellishments are felted onto a background – below are my general guidelines for this type of Felting – then scroll further down and there are examples of my work. 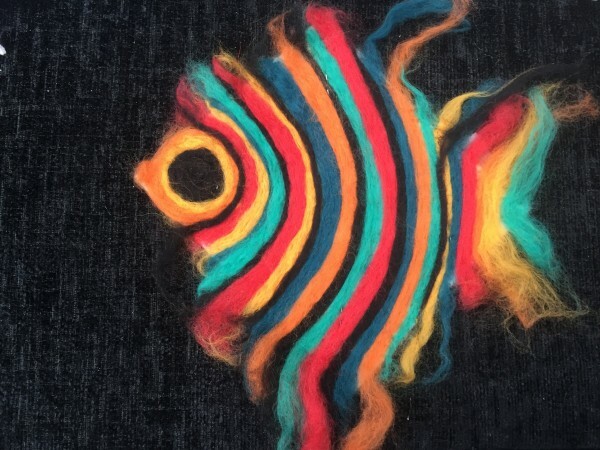 This is truly a relaxing craft for which no skills are required to achieve an abstract collage – you can even work on your knee in front of the TV. 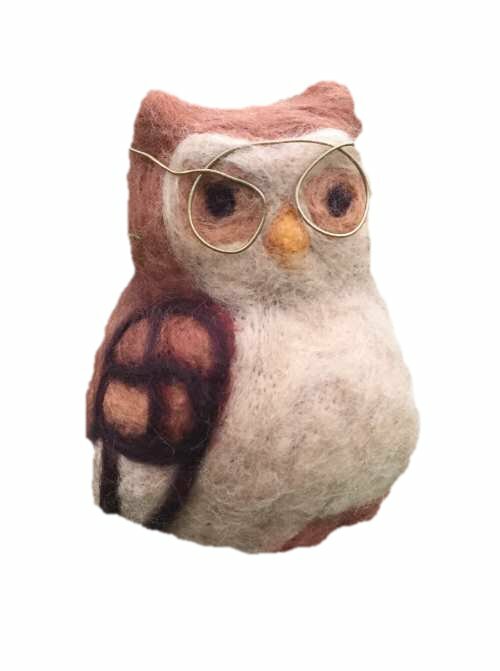 Needle Felting is basically of way of fusing wools & fibres together onto a backing fabric – usually a felt. .
Place a piece of felt onto the foam block, cut to whatever size you require. Lay some Merino Wool onto the felt first. It is best to use less rather than more – you can always add more as you build the design up. Blend your colours together. Push the felting needles through so that it ‘fuses’ the wool to the backing felt. (If you just felt with wools on their own this will produce felt in its own right). Build your design up gradually and remember that you can either cover the whole of the felt or leave areas of the background showing through. By felting with the Merino Wool you will see that you can cover the area quite quickly. The wools can be used randomly, for an abstract design, or you can work stripes, plaid etc. 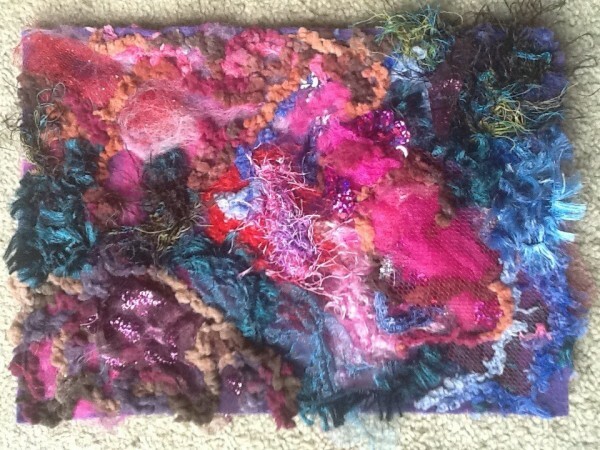 Silks and miscellaneous yarns can be added to increase the texture and interest in the piece, as well as colour contrast. Work in sections and move the piece around the foam block as you complete different areas. (Avoid working close to the edge of the foam for safety reasons!) Continue to embellish and add until you are happy with the result. General Tips Feltin g Needles are very sharp with side barbs and are not recommended for children. Always be aware of where your figures are in relation to the needle. Make sure to put the protective cover over the needles when the tool is not in use. Always use a straight up and down motion when needle felting. Go in as straight as possible – entering the piece at an angle will bend the needle and cause a possible breakage of the needle. 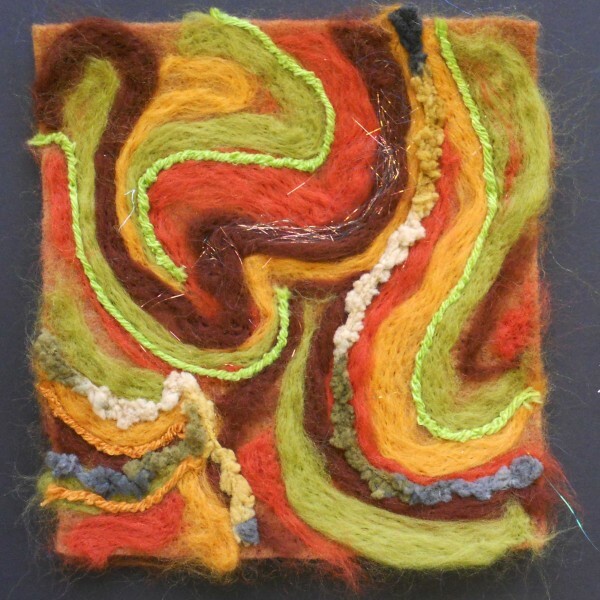 Felt a shape by using metal shape cutters – start by felting around the outside of the shape and work your way in to the centre. Bring the loose edges of the wool/fibre into the centre. The more you puncture the fibres the more fused they will become with the base fabric. Lift the work from the foam frequently, you will also be able to see on the back the fibres poking through. 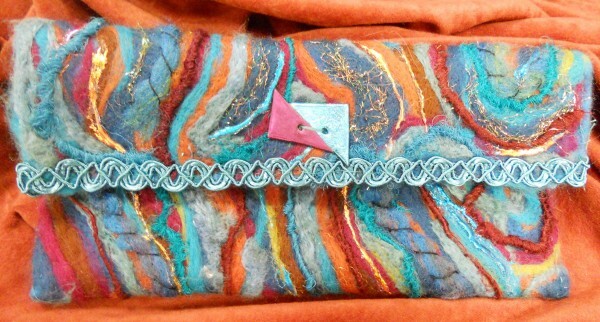 If you want to include embellishments which will not felt (sequins perhaps or corded threads) then you can either use your felting wools over the top to ‘trap’ them – or couch them in with hand stitches. If you are using items such as sequins be careful not to catch your needles on them to avoid needle breakage.